We’re not sure we were prepared for the responses we got when we got a chance to chat with Broad City star Abbi Jacobson, but that doesn’t mean they weren’t delightful as anything. Jacobson is back on the ground putting together a comedy festival on a plane (yeah, you read that right) in partnership with Virgin Atlantic. Called #LiveFromVirgin, the festival’s lineup was curated by Jacobson herself and a group of hand-picked and oh-so-talented comedians got to regale a group of strangers in the sky. Jacobson even got to document part of her experience on social media with funny Instagram posts to keep those of us with our feet on the ground entertained and in the loop. If that’s not the best way to fly, we don’t know what is. These were just some of the many illuminating, hilarious and exciting answers Jacobson gave during her exclusive interview with us. Check out the other things we learned after speaking to her. SheKnows: What joke got the most laughs during #LiveFromVirgin? Abbi Jacobson: To be honest, I’m not sure. Laughs are hard to quantify via social media! SK: What is the biggest difference between Broad City Abbi and IRL Abbi when it comes to traveling? Who’s the nervous flyer? Who’s checking in for their flight early? Who’s smuggling liquid in a travel-safe-size bottle from outside the terminal onto the plane? AJ: I would say probably Broad City Abbi is more nervous and anxious. I fly a lot these days, so I’m getting more used to the ins and outs of feeling comfortable. I try to plan as much as I can, but I think the core of who I am can’t help but get in the situation where I am sprinting for a flight. It’s the Jacobson curse. SK: What is the most beautiful thing about comedy? AJ: Comedy can simultaneously allow you to dive headfirst into the world’s pain and escape it. SK: What’s it like corralling a bunch of comedians for one common goal? AJ: Pretty wonderful. I’ve had the opportunity to do this in a bunch of different ways, whether it be for Virgin or Broad City or other projects. Collaboration is so essential and satisfying to me. I love when individual voices can make up something bigger and still maintain their originality. SK: Please tell us everything you can about the binge-drinking princess TV show you’re currently working on because we’re already obsessed. AJ: I think you mean in Disenchantment? I don’t know how much I can say about this show, but the experience thus far (I’ve been recording since about February) has been absolutely incredible. It’s just a dream job with the best of the best in animation and comedy. It’s such a collaborative environment and I’ve gotten to bring a lot to the character. I can’t wait for it to come out! SK: What characteristics of your zodiac sign do you embody or relate to the most? AJ: Oh boy, I should know more about this. I’m an Aquarius. I think we tend to be very creative, free-thinking and emotional? I think I’m a bit of those things. SK: What’s a typical daily routine look like for you? AJ: A typical day for me changes a lot over the course of the year, depending on what phase we’re in on Broad City and then if I’m working on something else, so I have a hard time forming routines. But no matter what, I always start with coffee. I’m pretty addicted, and I listen to the podcast The Daily as I’m getting ready. I feel like I can begin after that. Then I work, again, either writing, shooting or editing the show, or we’ll be in press mode. Then I either hang out with friends or make the most basic [food] (I’m not a great cook… yet) and I’ll watch something. Then I try to read right before I go to bed. SK: What’s is nonnegotiable when it comes to friendships? AJ: I think being compassionate of each other’s lives and issues. We’re all going through different stages and issues, and as I get older, I’m trying to lean into that. SK: Who are you still dying to work with? SK: What personal goals do you have for yourself now that you have such a solid platform and following? AJ: I made a little pact with myself to only do projects I believe in for one reason or another. Something has to really stand out to me, big or small. I want to be more thoughtful and put things out into the world that say something. We can’t wait to see what’s next for Jacobson on the rest of the fourth season of Broad City as well as in the future. 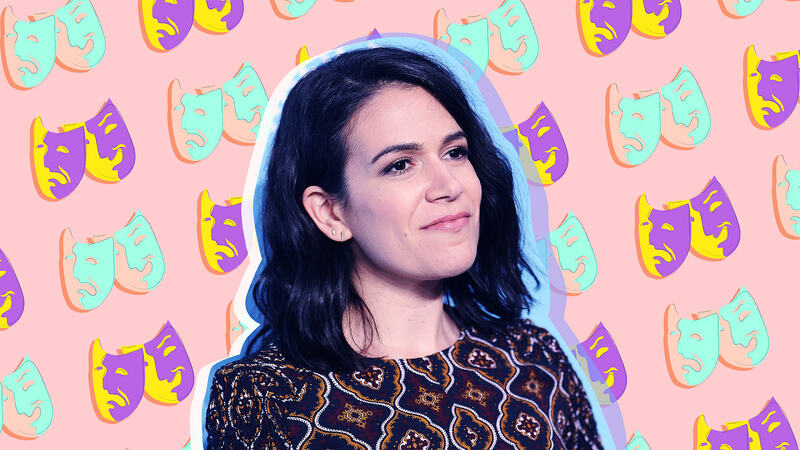 With so many exciting projects, including her new show Disenchantment, her podcast A Piece of Work and her artistic endeavors, there’s plenty more to get hyped about when it comes to Abbi Jacobson.